Determination of trace moisture in plastic particle includes pressure difference method, electrolysis method, Karl Fisher method etc. Among which, the moisture determination by differential pressure, with its advantages in rapidness, accuracy, operational convenience, and low operational costs, etc, has been widely applied during the intermediate processes in chemical fiber and plastic industries, especially for measuring the trace moisture contents in the particles such as polyester chips, nylon 6, nylon 66 chips, etc, which directly and considerably affect the quality of filatures prior to being molten and after being dried. This method is also applicable to measure the general trace moistures in the particles such as nylon 6, nylon 66, etc and plastic resins. 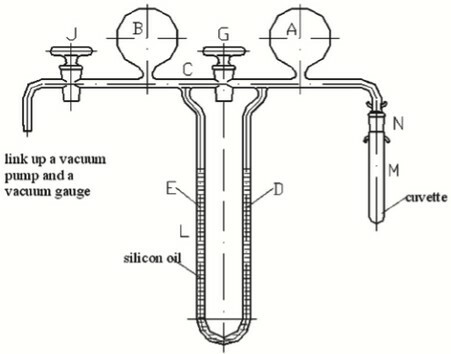 The determination device of moisture by the pressure difference method may be applied to measure extremely trace moistures bonded with the internal molecular structures of raw materials; but they may not be applied to measure the moistures balanced between raw materials and environments. When materials are heated up and molten with internally contained moistures, they may be degraded and their feature viscosity may be decreased, and product quality may be directly affected. It is generally required that prior to making filatures, the moisture ratio must be less than 0.03%; therefore, after raw materials are dried and before they are made into filatures, the pressure difference method must be applied to measure their internal extremely low moisture ratios. The moisture ratio in vacuum-packed plastics may also be measured by applying the pressure difference method. This device can measure 1.5mg in water content at highest. When test samples contain higher contents of the volatilizing mixtures other than water, the reliability of testing results must be considered.